The 1988 United States presidential election in Colorado took place on November 8, 1988, as part of the 1988 United States presidential election, which was held throughout all 50 states and D.C. Voters chose 8 representatives, or electors to the Electoral College, who voted for president and vice president. 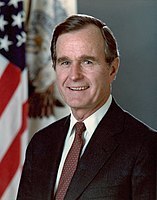 Colorado voted for the Republican nominee, Vice President George H. W. Bush, over the Democratic nominee, Massachusetts Governor Michael Dukakis, by a margin of 7.78%. Bush took 53.06% of the vote to Dukakis's 45.28%. While the Republicans held onto Colorado's 8 electoral votes, however, Bush's 53-45 win over Dukakis represented a vastly diminished margin compared to 1984, when Ronald Reagan had won the state in a 63-35 landslide over Walter Mondale. The closeness of the race marked the beginning of Colorado's transition from a reliably Republican state into a competitive swing state in presidential elections, as just four years later, in 1992, Bill Clinton would win the state for the Democrats for the first time since the nationwide Democratic landslide of Lyndon Johnson in 1964. 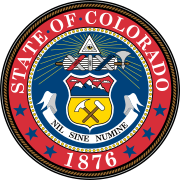 Beginning in 1988, Colorado's popular vote in presidential elections has always been decided by a single-digit margin, and in the seven elections that followed 1988, the state would vote Republican three times and vote Democratic four times. ^ "1988 Presidential General Election Results - Colorado". Dave Leip's Atlas of U.S. Presidential Elections. Retrieved 2013-01-29. This page was last edited on 14 December 2018, at 17:38 (UTC).